Kuilfontein offers Colesberg bed and breakfast or dinner, bed and breakfast accommodation in Colesberg, in eight luxurious guest rooms. 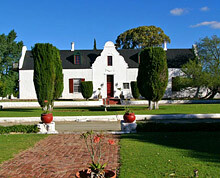 There is also a pub; and an intimate dining room where guests can sample fresh South African guest farm produce. Leigh and Penny Southey and their staff are renowned hosts where guests become dear friends. The Karoo is famous for its wide open spaces and healthy climate. There is excellent bird watching and game viewing on foot and Anglo / Boer war and Stone Age sites are on the farm. You can take a quiet stroll, cool down in a fresh spring water pool or play a game of boule. Star gazing is spectacular in this part of the world. Member of the Portfolio Bed & Breakfast Collection and is graded "Great Comfort".